Mycotic aneurysms and infected aneurysms are synonyms. Mycotic aneurysm secondary to tuberculosis is a rare entity. In this article we report a case presenting with fever of unknown origin and abdominal pain and diagnosed with mycotic aortic aneurysm secondary to miliary tuberculosis, paraaortic lymph node involvement which is ultimately referred for surgery after anti-tuberculosis treatment. ISNAD Öztepe, Ayşegül Beste , Komaç, Andaç , Somay, Rıfat , Köse, Şükran , Akar, Harun . "Tubercular mycotic aortic aneurysm presenting with fever of unknown origin". 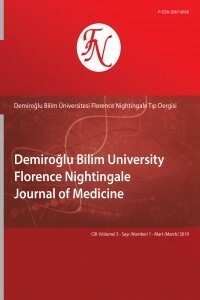 İstanbul Bilim Üniversitesi Florence Nightingale Tıp Dergisi 3 / 4 (December 2017): 112-116.